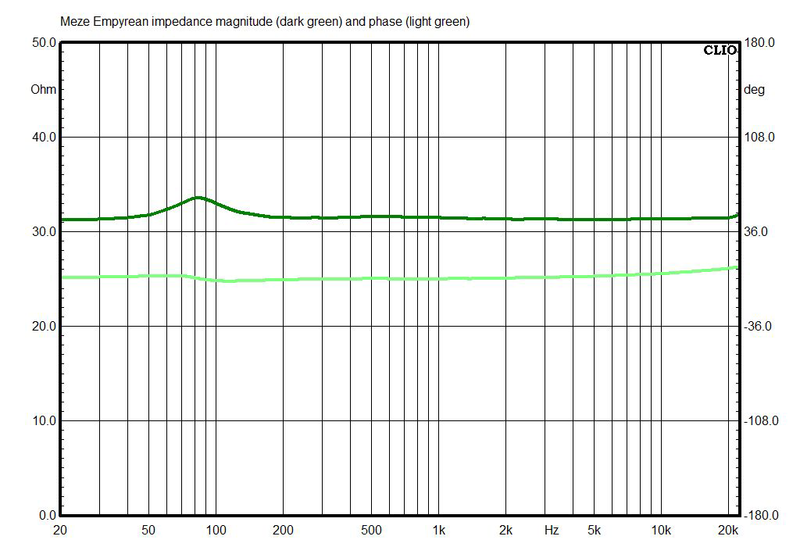 I measured the Empyrean headphones using laboratory-grade equipment: a G.R.A.S. Model 43AG ear/cheek simulator/RA0402 ear simulator with KB5000/KB5001 simulated pinnae, and a Clio 10 FW audio analyzer. For isolation measurements, I used a laptop computer running TrueRTA software with an M-Audio MobilePre USB audio interface. The headphones were amplified using a Musical Fidelity V-CAN and an Audio-gd NFB-1AMP. Except as noted, measurements were made using the leather earpads. These are “flat” measurements; no diffuse-field or free-field compensation curve was employed. If you’d like to learn more about what our measurements mean, click here. 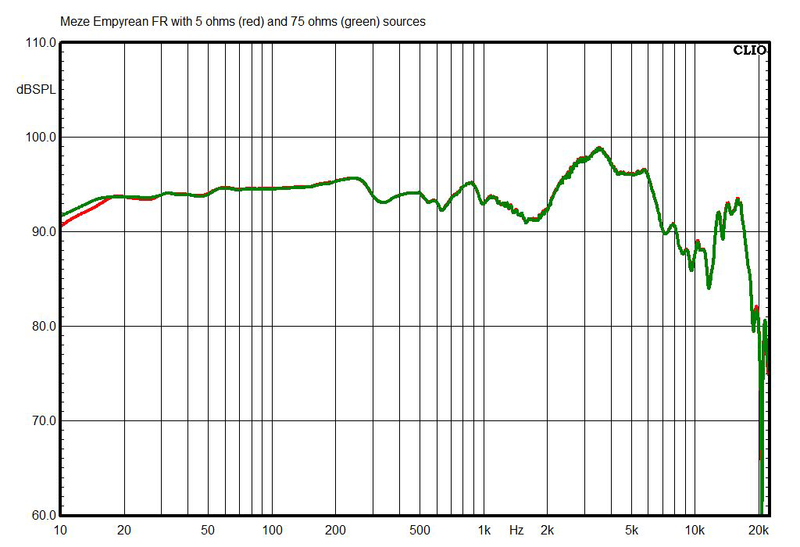 The above chart shows the Empyreans’ frequency response. 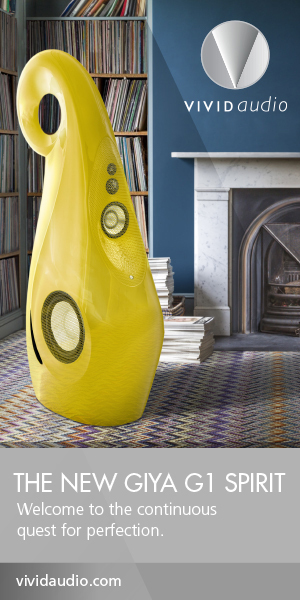 This is flatter than I usually measure in large, open-back audiophile headphones. We can still see the typical broadband rise in the bass and lower mids, as well as the usual peaks in the 3 and 6kHz regions, but the magnitude of these rises is a few dB less than typical. 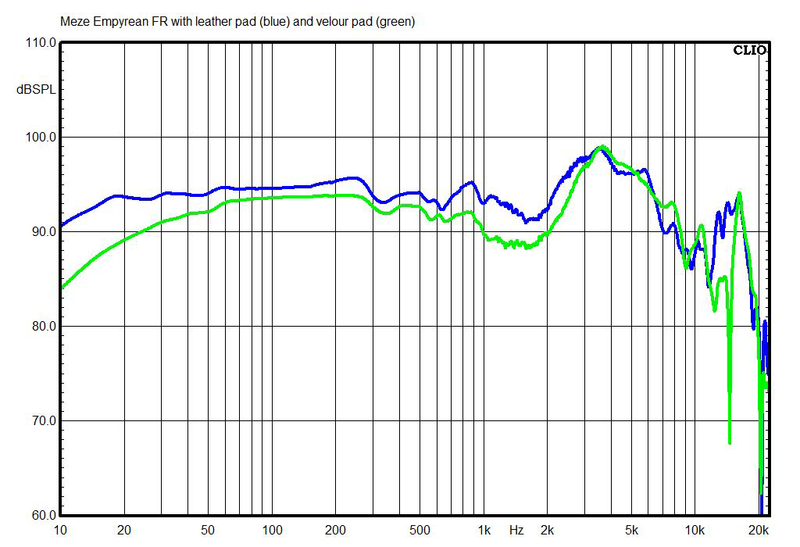 Here you can see how the frequency response changes when the velour earpads are used. The velour pads basically provide a broadband reduction of -1 to -4dB below 3kHz, which will make them sound more trebly. 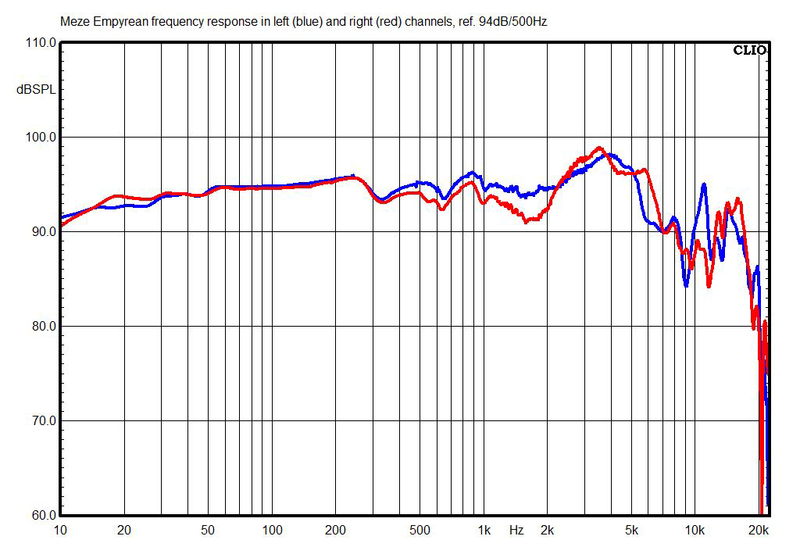 This chart shows how the Empyreans’ tonal balance changes when they’re used with a high-impedance (75 ohms) source, such as a cheap laptop or some cheap professional headphone amps. 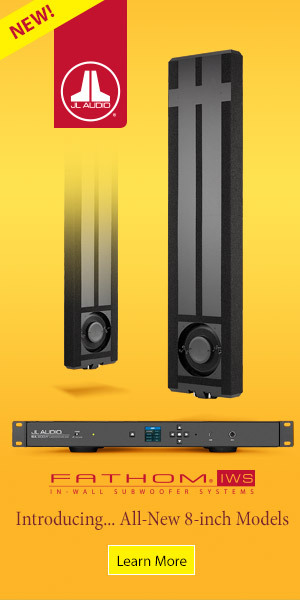 Using the higher-impedance source produces a change only below 20Hz, which won’t be audible. 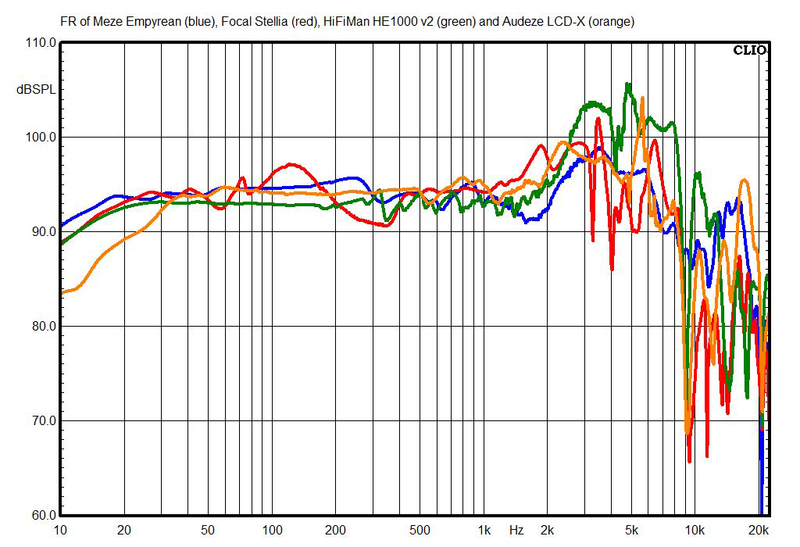 This chart shows the Empyreans’ right-channel response compared with two high-end open-back headphones (Audeze LCD-Xes and HiFiMan HE1000 V2s) and one high-end closed-back model (Focal Stellias). Interestingly, the Empyreans’ response is closer to that of the closed-back Stellias than it is to the open-back models. The Empyreans’ spectral decay (waterfall) chart shows the same hashy, low-level (-40dB) midrange resonance I see in almost all planar-magnetic models (which is apparently caused by sonic reflections between the large, flat driver diaphragm and the flat plate of the ear/cheek simulator), but the lower-frequency resonances seem somewhat better-controlled than in most headphones I’ve measured. 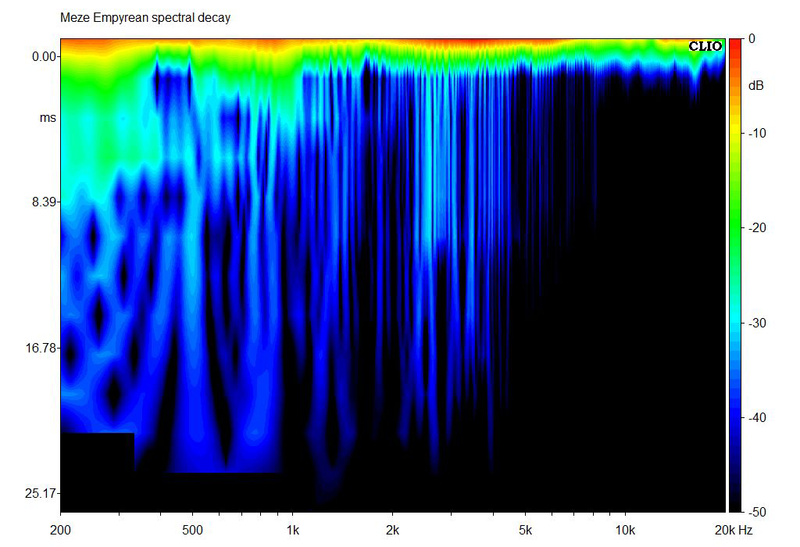 The Empyreans’ measured total harmonic distortion (THD) is nearly zero within the audioband, even at extremely high listening levels. In this chart, the external noise level is 85dB SPL, and numbers below that indicate the degree of attenuation of outside sounds. 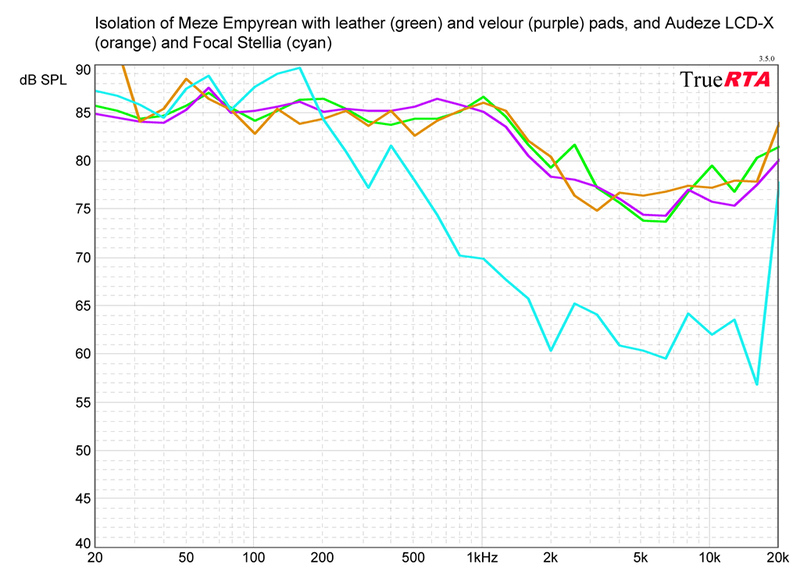 Isolation of the Empyreans is comparable to that of most other open-back audiophile headphones -- i.e., there isn’t much. 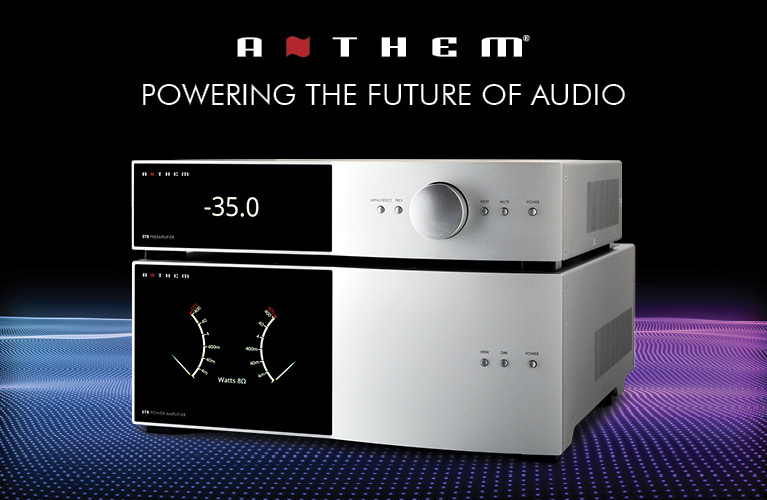 The impedance magnitude of the Empyreans is essentially flat at about 31 ohms (the rated impedance is 31.6 ohms), with a tiny rise to 34 ohms centered at 82Hz. 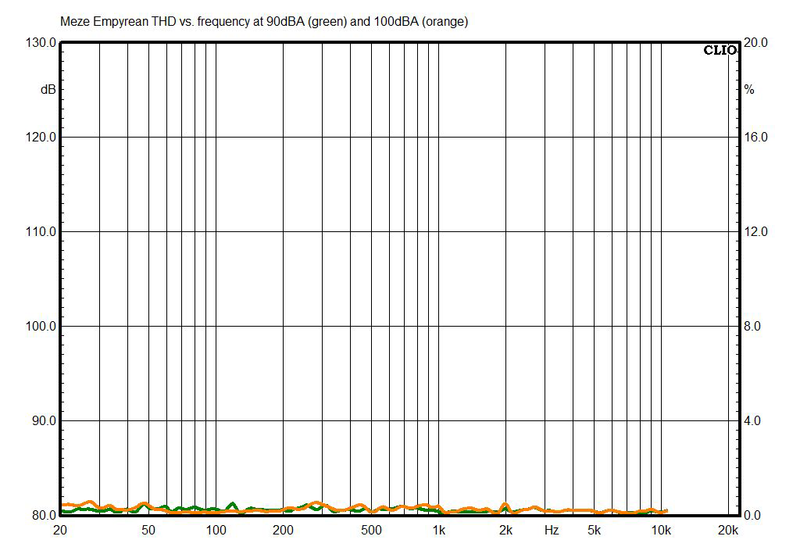 Sensitivity of the Empyrean headphones, measured between 300Hz and 3kHz, using a 1mW signal calculated for 31.6 ohms rated impedance, is 99.1dB -- basically right on the rated 100dB, and sufficient sensitivity to let you get loud volumes when plugging the Empyreans straight into a smartphone or tablet.